We are bound to be a little bit biased about why couples planning their wedding and honeymoon should choose the Lake District as their number one honeymoon destination, but we’re sure you’ll agree after reading our helpful guide. The Lake District is a popular mini-moon destination for newlyweds wanting to enjoy a relaxing break straight away following the madness of wedding planning and the big day, with a long-haul honeymoon planned for later. For the first time in over 25 years, newlyweds can fly from London Southend to Carlisle Lake Districtin just over an hour. That’s just enough time for a sky-high G&T with the added bonus of zero jetlag. This means that you can be walking hand-in-hand along England’s rooftop, Scafell Pike, within 24 hours of walking down the aisle. The UNESCO protected mountain and lake scenery of the Lake District really does feel a million miles from anywhere, yet it is only a 2-hour drive from Manchester, just over 2-hours from Leeds, only 1 hour 44 minute train journey from Liverpool and less than 3-hours via Virgin Trains from London. If you’re looking for a stress-free and a laid-back honeymoon, there’s no currency exchange (though the Lakes Pound could be fun), immunisations or specialist insurance to sort out and you can get the most out of your honeymoon as time isn’t wasted on jetlag. Bucket lists are a keen favourite with honeymooners who, these days, are looking for adventure and experiences of a lifetime, of which the Lake District is jam-packed. A hike up England’s tallest mountain, a cruise along the UK’s largest lake, a daring adventure on one of Europe’s highest Via Ferrata’s, several of the steepest cycle climbs in the country – these are all memories and experiences that are not only Instagram-worthy, but memories you’ll treasure for life. It is in the Lake’s that honeymooners enjoy their first ever hot air balloon ride, stand-up-paddle boarding (SUP), try rock climbing for the first time on the rocks where the sport was invented and enjoy the most dramatic landscape in the country. Have you tried Between, the ‘relationship app for couples in love’ that is ideal for scrapbooking these memories and making plans for your next adventures. Honeymoon tours are now a popular alternative to all-inclusive trips, as couples look for experience holidays. The Lake District is a popular stop-off on a Europe Honeymoon Tour. Couples take in the romance of visiting the former home of poet William Wordsworth, enjoy a romantic cruise on a Steam Yacht Gondola and take afternoon tea in a country house. Bowness and Windermere has long been the escape for England’s wealthy. It is home to several luxury spa facilities. With the breathtaking mountain and lake backdrop, it makes an ideal spa break, rivalling many of its European counterparts. There’s nothing more romantic than sinking into a hot tub with a glass of sparkles and only your loved one for company. Let the soothing warm water and jets, invigorating fresh air and breathtaking scenery do their magic. Be transported away from the whirlwind of wedding guests, seating arrangements and speeches. The Lake District is home to no less than four Michelin-starred restaurants (The Samling, Forest Side, The Gilpin, L’Enclume) and has retained a strong reputation for some of the best dining in the UK. The range of eating out options in the Lake District is quite staggering too, from traditional fell side inns to snazzy champagne bars. Many visitors are surprised to find artisan coffee houses alongside traditional tearooms. For foodies, the Lake District is a must on your honeymoon tour itinerary. Royal newlyweds Harry and Meghan have reportedly chosen a log cabin in a remote location in Canada for their honeymoon, with outstanding lake and mountain views, local fine dining, outdoor activities and spa indulgences as a top priority. Why don’t they head to the UK Lakes, we wonder? A luxury Lake District log cabin set in breathtaking scenery is favoured by many honeymooners because the small romantic spaces are purpose built for enjoying the romance and tranquillity of the great outdoors. Surrounded by trees, greenery and perhaps with a lakeside view, you’ll feel a million miles away from anywhere. What bliss, we say. The only time that it is acceptable to invite a third guest on your honeymoon, is when it is a four-legged companion. A dog friendly honeymoon in the Lakes can be so much fun. Pooch will drag you outdoors at every occasion and will entice you to some of the quieter spots, such as peaceful Ennerdale where Bill Clinton first proposed to Hilary Clinton. To name-drop, Pippa Middleton and Paul McCartney are two other celebrities who got engaged in the Lake District. Of course we love all of our guests. But what an extra-special treat it is to welcome honeymooners. 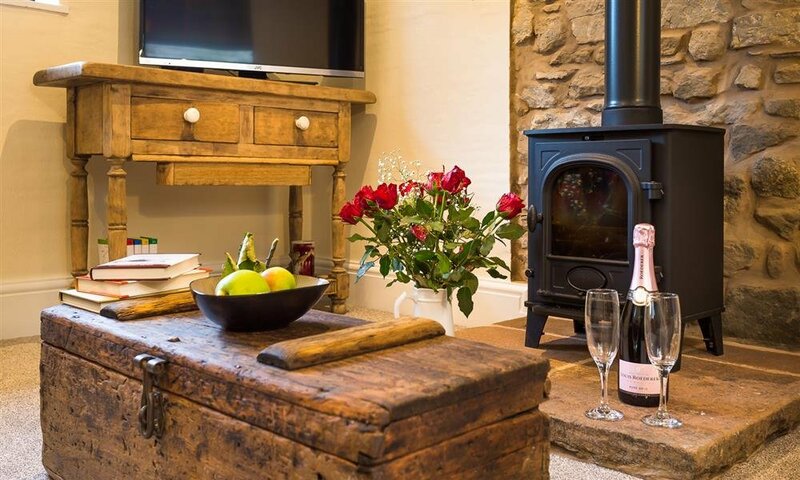 One of our romantic cottages with a particular penchant for luxury treats loves to spoil their newlywed guests. The Grooms Cottage, one of our northern-most cottages that is located just a 20-minute drive outside Keswick, has a very dreamy ‘honeymoon package’, where the new Mr and Mrs are welcomed with a complementary bottle of Champagne set with glasses, all ready to pop (Proof of marriage is required to redeem the complimentary honeymoon champagne with Grooms Cottage). At Grooms Cottage, upon arrival you’ll find a delicious homemade cake as well as freshly baked bread, free-range eggs and milk. All ready for a romantic breakfast in bed and gorgeous afternoon tea. The huge, pretty, private garden at The Grooms Cottage is as romantic as any honeymoon cottage could be. 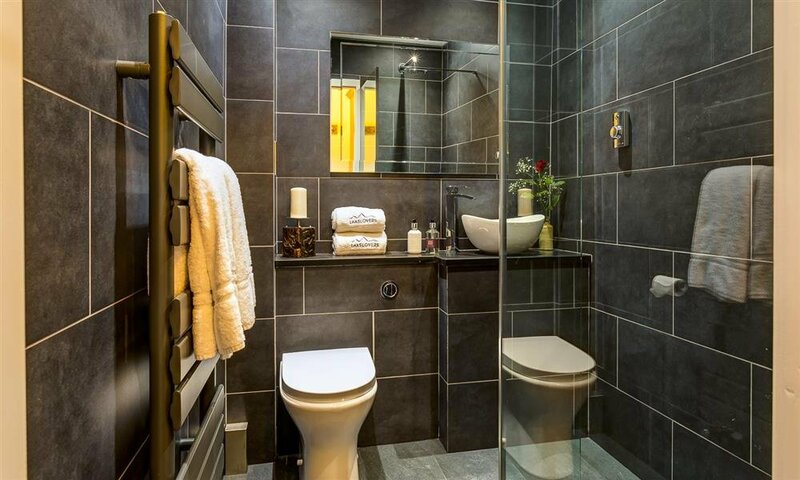 The sleek walk-in shower, with luxury bathroom products has the feel of an upmarket hotel, as does the stylish, bespoke décor, which is a mix of hand-crafted and designer. The owners take delight in offering various extras and the romantic red roses, Lake District chocolates and luxury hampers that can also be ordered are favourites for newlyweds. Once you’re set on the Lake District as your mini-moon destination, part of your honeymoon tour or as your second honeymoon, a luxury cottage in an unrivalled location will complete your dreamy honeymoon plans. Here are some more of Lakelovers’ favourite honeymoon cottages in the Lake District. The Lake District is such a laid-back and easy honeymoon destination, that we suspect you’ll return time and again, to revisit your honeymoon memories. Whilst we don’t expect you to share any of your honeymoon snaps whilst away, we’d love to hear from you when you return from cloud nine.